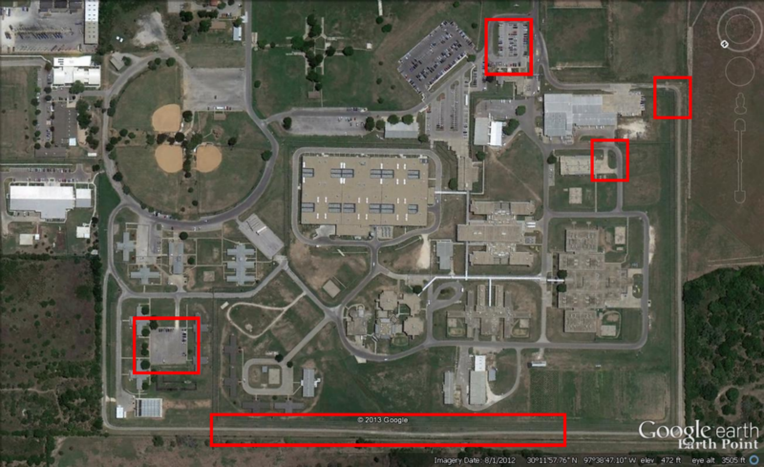 Project Description: Travis County proposed drainage and road improvements for the Travis County Correctional Complex. Several areas were subject to flooding and deterioratings road and pavement conditions. Services Provided: I T Gonzalez Engineers was retained by Travis County to perform land surveying and engineering services. Roads were reconstructed to allow safe driving conditions. Demolition and reconstruction of parking lot to alleviate drainage issues, including seal coating. 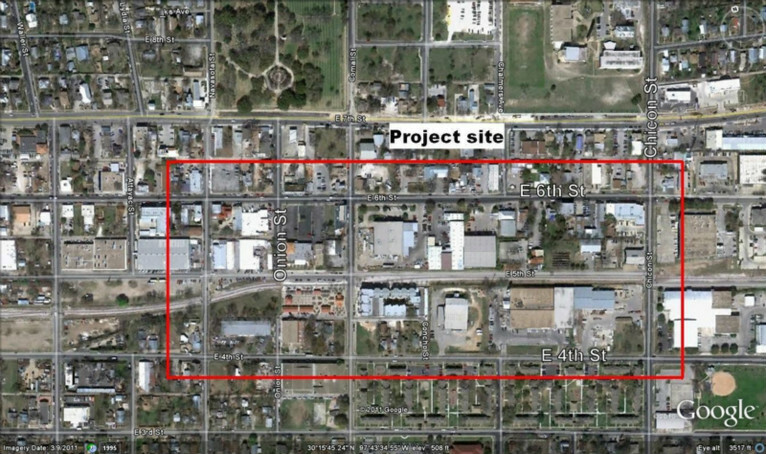 Project Description: The City of Austin water project, Plaza Saltillo Water Line Rehabilitation Phase II, will upgrade the water supply to meet the increased capacity needs of the area, which is bound by Navasota street to Chicon street from east to west & 4th street to 6th street from North to South, Water Grid K-22. Services Provided: I T Gonzalez Engineers provided professional services, which included, civil engineering, land surveying, environmental engineering, traffic control, and geotechnical engineering. The construction drawings prepared by our firm were for the new replacement water lines, 5500 lineal feet; abandonment of existing water lines, 5000 lineal feet; and the relocation of 21 building water lines within private property for sections of 4th, 5th , and 6th streets. More specifically, the construction drawings included plans and profiles for the new water line replacement (8” to 12” diameter), new service lines, plugging and capping the abandoned lines, relocation of building service lines within private property, water line disinfection, environmental plan, traffic control plans, and Stormwater Prevention Pollution Plan (SWPPP). 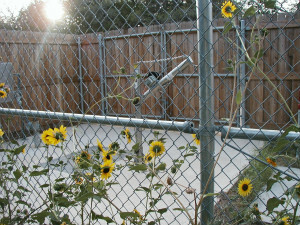 The drawings also contained City of Austin standard details. Project Description: Bastrop Independent School District (BISD) approved a bond to build a new high school campus that would have a running track, softball fields, baseball fields and soccer fields. The campus is located at the Southwest corner of S Pope Bend Rd and Hwy 71. The site options were those with the best surrounding infrastructure, including roads, traffic features, water, wastewater, and power. Services Provided: I T Gonzalez Engineers was retained by BISD to perform mapping, land surveying and civil engineering services. The land surveying services included a boundary survey, topographical survey, tree survey and utility survey for three tracts of land and two road right of ways that fronted the site. The civil engineering services included a site development feasibility study, as well as design and preparation of construction drawings for the combined 65-acre tract complete with drainage, water utilities, wastewater utilities, detention ponds, athletic facilities, retaining walls, and hydrological calculations. Our firm kept the site construction costs within the Opinion of Probable Construction Cost. Project Description: The Briarcliff Property Owners Association (BPOA) desired to evaluate the conditions of the five existing dams on Cat Creek. The BPOA consulted with I T Gonzalez Engineers for preliminary advice on how to address Texas Commission on Environmental Quality (TCEQ) recommendations. The Association retained our firm to perform the recommended services of an aerial survey, a floodplain study of Cat Creek, and a hydraulics study of the dam overflow structures. Services Provided: The aerial survey performed by our firm encompassed 1100 acres of land, while the Cat Creek watershed encompassed 819 acres (1.28 square miles) and 7800 lineal feet of creek bed. The floodplain study was comprised of floodplain levels and cross-sections of water levels with 100-feet maximums, including cross-sections at dams, cross-sections at streets that crossed Cat Creek, and drawings showing plan views of the calculated floodplain. The study considered 100- and 500 year storm frequencies for the purpose of satisfying TCEQ standards. Furthermore, the study contained options for the dams and dam overflow structures to satisfy TCEQ requirements. 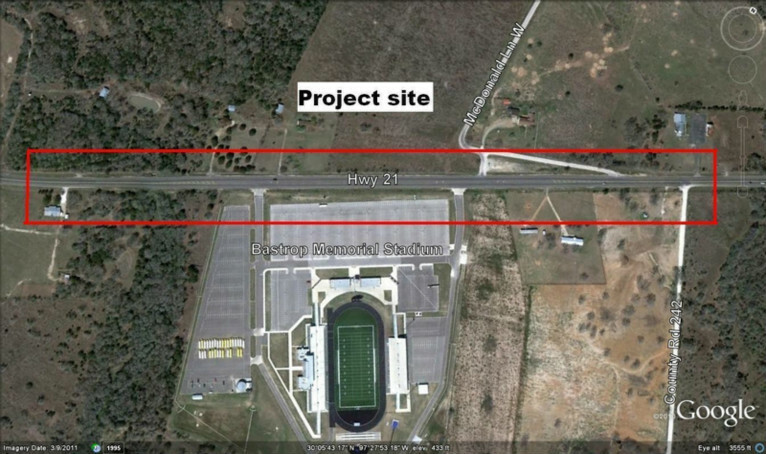 Project Description: The objective was to widen 2600 lineal feet of HWY 21 to include a left hand turn lane for access to Bastrop Memorial Stadium. Services Provided: I T Gonzalez Engineers was retained by the Bastrop Independent School District (BISD) to perform mapping and land surveying services, civil engineering services and structural engineering services for the anticipated road improvements to 2600 lineal feet of HWY 21. Our land surveying services included a boundary survey of the adjoining tracts of land on both sides of the HWY 21 as well as mapping and topographical survey of the road right of way that was to be improved. For the civil engineering portion, our firm provided an analysis of the existing road conditions, prepared a conceptual plan based on the latest Texas Department of Transportation (TXDOT) Design and Construction Standards, prepared construction drawings in compliance with TXDOT Standards, estimated construction costs, and procured a permit from TXDOT. 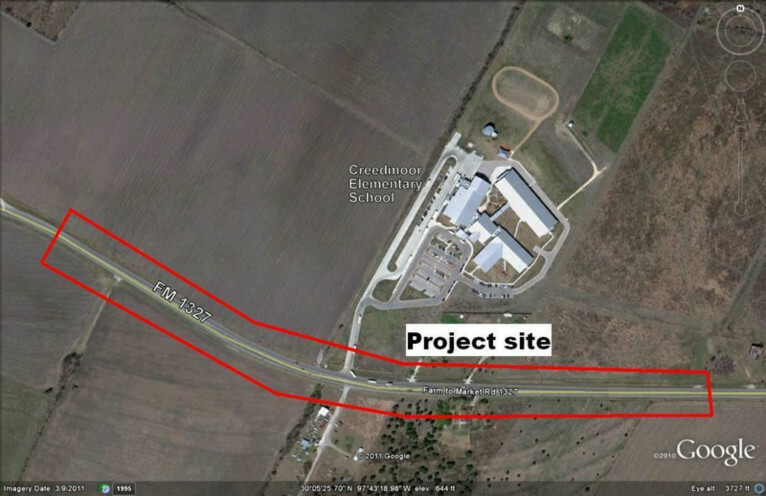 Project Description: This project entailed the widening 2700 lineal feet of FM 1327 to accommodate a left turn lane into Creedmoor Elementary School and installation of 10-foot shoulders. Services Provided: I T Gonzalez Engineers provided civil engineering and land surveying services for the proposed improvements to FM 1327. Our firm performed a topographical survey of right of way, which included a boundary survey of the adjoining tracts of land on both side of FM 1327 tree survey, and utility survey. From the topographical survey seven right of way dedications were prepared. The construction and bid documents for the 2700 lineal feet of road improvements were prepared in compliance with Texas Department of Transportation (TXDOT) Standards. Our firm prepared a construction cost estimate of anticipated improvements using TXDOT unit prices and procured a permit from TXDOT. A hydrology report of existing and proposed conditions was prepared by our firm to demonstrate the change in drainage conditions. The final construction cost was within the Probable Opinion of Construction that was prepared by our firm. 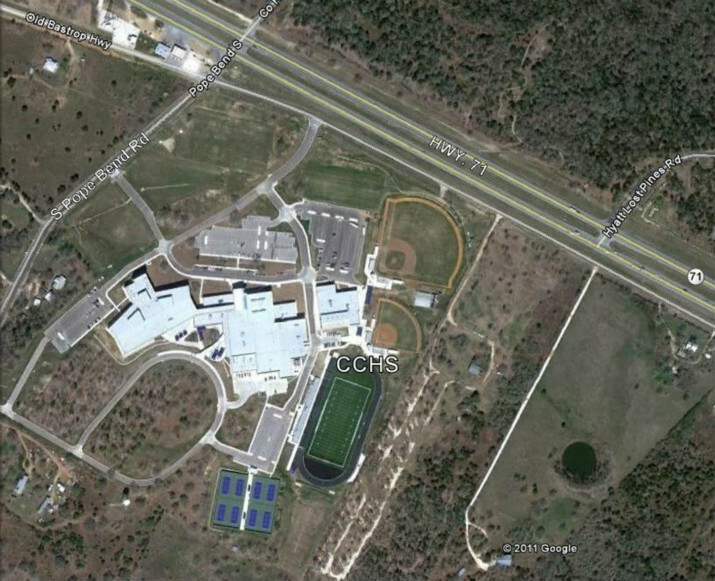 Project Description: The Bastrop Independent School District retained I T Gonzalez Engineers to provide land surveying, route mapping and civil engineering for a Lower Colorado River Authority (LCRA) wastewater system and lift station. The project required a gravity system, approximately 1.2 miles, which discharges into lift station. 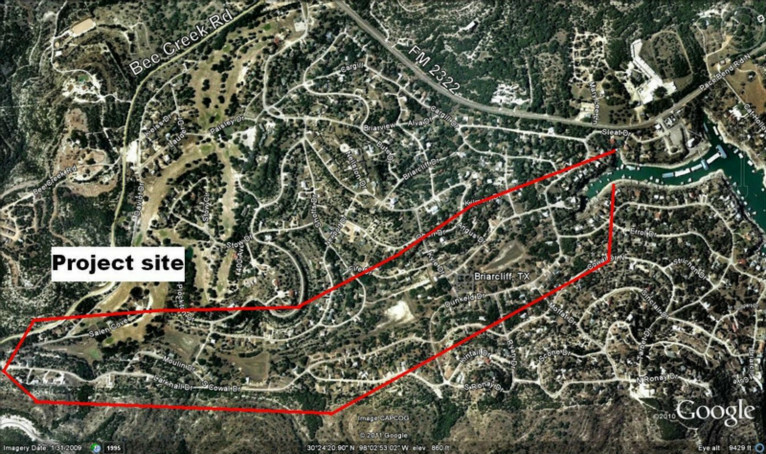 The sewage from Lost Pines Elementary is pumped approximately 0.55 miles to existing LCRA Sewage Treatment Plant. Services Provided: I T Gonzalez Engineers surveyed and mapped 1.2 miles of right of way and 0.55 miles of the tentative force main route through heavily wooded area. Our firm designed and prepared construction drawings for a gravity line, 1.2 miles, a lift station and a 0.55 miles force main. 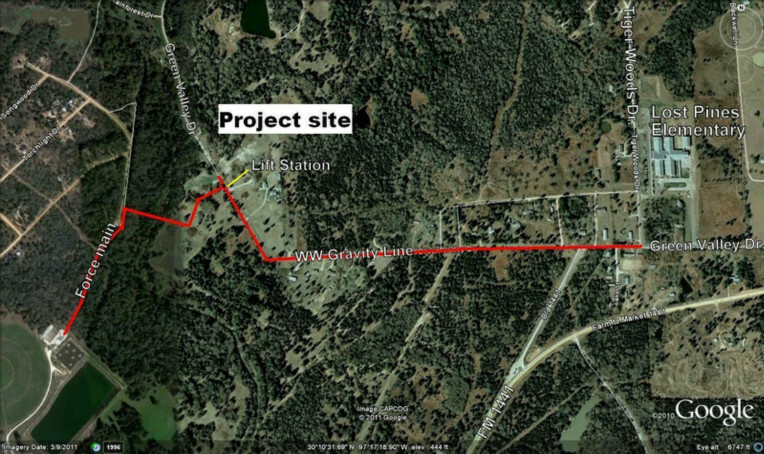 The 8” gravity line was installed in County Road, the lift station was placed on easement located in private property, and the 0.55 miles of force main traversed through acquired easements to existing LCRA lift station. 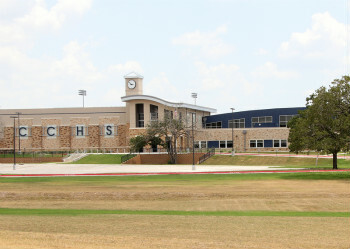 Our firm acquired the easements for the LCRA and Bastrop Independent School District. 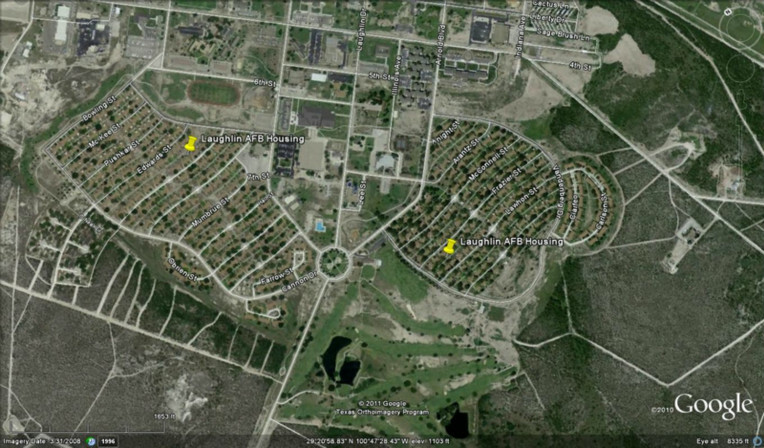 Project Description: The project site at Laughlin AFB included the housing areas for enlisted men and officers. The water distribution system, 11,330 lineal feet and wastewater collection system, 27,775 lineal feet, was in dire need of repair. Infiltration into wastewater collection system and water line leakage was existing. Videotaping of wastewater system clearly showed the extent of damage to the lines. Services Provided: I T Gonzalez Engineers, was retained to analyze and report on the condition of water & wastewater systems. As a result, our firm prepared a conceptual plan for the replacement of wastewater system using trenchless technology and replacement of the water distribution system. Our firm designed and prepared construction drawings & specifications for the sliplining of 25,775 lineal feet of existing wastewater mains to upsize them using pipe bursting methods and replacement of 11,330 lineal feet of the water distribution system. 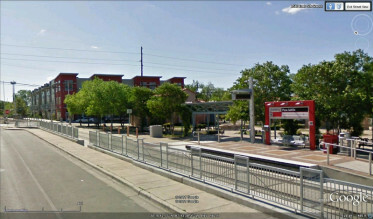 The project came in under the anticipated cost of construction.